Pennsylvania requires vehicle safety inspections to ensure that vehicles are maintained for safe operation. Safety Inspections can prevent vehicle failure on the highways and crashes that may result in injuries or death. Vehicle safety inspections are performed at official PennDOT Inspection Stations (usually a repair garage or a service station with a repair shop). Inspection fees are posted at official inspection stations. These fees do not include repairs to correct vehicle defects. Click on any of the links below to find information about vehicle safety inspections and other related information. What are the inspection criteria for passenger cars and light duty trucks? Safety inspections for passenger cars and light-duty trucks require that the following items be checked: suspension components, steering, braking systems, tires and wheels, lighting and electrical systems, glazing (glass), mirrors, windshield washer, defroster, wipers, fuel systems, the speedometer, the odometer, the exhaust systems, horns and warning devices, the body, and the chassis. For most vehicles in the 42 county, Non-I/M region this safety inspection will also include a Visual Anti-Tampering Check. The Visual Anti-Tampering Check is an examination of the vehicle to see if the required emissions components have been tampered with or removed. For more information concerning the 42 County Visual Anti-Tampering Check, please reference Section 175.80 of Subchapter E of the Vehicle Equipment and Inspection Regulations. For a complete list of the rejection criteria for passenger cars and light duty trucks, please visit Subchapter E of the Vehicle Equipment and Inspection Regulations. Pennsylvania’s emissions inspection program was customized to meet specific regional air-quality issues and improvement goals while focusing on customer convenience. A great deal has been done to improve air quality in Pennsylvania; however more vehicles on the road and more miles being traveled are offsetting this progress. Vehicle emissions inspections are part of Pennsylvania’s plan to clean the air and keep it clean in the future. Select from the links below to find information about vehicle emissions testing in your region. 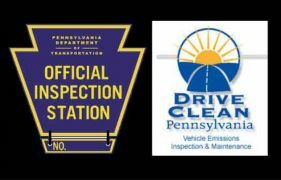 Please visit Drive Clean PA for additional information on Pennsylvania’s vehicle emissions testing program, answers to frequently asked questions about emissions inspections, emissions inspection forms, and other related information. Paul’s Motor Car Service is a Licensed PA State Inspection and Emissions Facility. We are also able to do Emissions Waivers as allowed by the State of PA.